Common colds are the primary reason people miss school and work. Most coughs, colds, and sore throats are caused by viruses and will resolve on their own. A visit to a healthcare provider and antibiotics are generally not needed. However; if you are getting worse after about 5 days or you have symptoms, such as ear pain, shortness of breath, or wheezing, high fever, muffled voice, inability to swallow, neck stiffness, vomiting, or asymmetrical tonsils, you should see a healthcare provider. Please review the following information to learn self-care tips and determine if you should be seen. You can also call and speak with a nurse if you have questions (707) 826-3146. 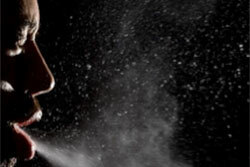 Avoid close contact with people who are sick, sneezing, or coughing. Avoid any situation which could transfer the saliva of a sick person to your mouth, such as using the same toothpaste tube or handling objects contaminated with saliva. Eat a well-balanced diet. Limit sugar (lowers your immune system). You can also help prevent the spread of the flu by staying home if you do get sick. Individuals who miss one of the scheduled on-campus vaccination clinics are encouraged to contact their local pharmacy or primary care physician directly.